Romsey Shire (1871-1995), south of the Great Dividing Range and east of Mount Macedon was created on 16 June 1871. It extended from Lancefield in the north of Clarkefield, but excluded the district of Springfield which was created as a separate shire at about the same time. In 1890 the Lancefield district was severed and made a separate shire. On 31 May 1916, Lancefield and Springfield shires were united with Romsey shire, and it remained more or less in that form until absorbed by amalgamation in 1995. The three most populated towns, Lancefield, Riddells Creek and Romsey were in the western half of the shire. The shire had a railway from Clarkefield to Lancefield (1881-1956) and another on its northern edge from Kilmore to Lancefield (1892-1904). During the 1880s and 1890s milk/butter factories were opened at Romsey and Lancefield, and creameries were at Rochford and Mount William. The factories operated until 1960 (Romsey) and 1930 (Lancefield). The shortage of farm labour after World War II and the high prices for wool during the 1950s resulted in a shift from crops to grazing. Sheep and cattle studs were established at Bolinda and elsewhere. By the late 1970s farm costs and low prices saw some farmers sell their properties for rural/residential subdivision or as weekend farms. The township of Romsey quadrupled in population between 1976 and 1996. Romsey shire contained the localities of Kerrie, Hesket and Cherokee in the Macedon foothills, Darraweit Guim on its eastern side and Riddells Creek at its south-western corner. At the north-east of the shire Mount William was the site of an Aboriginal stone quarry, from which hard greenstone was bartered over a wide area. The quarry is on the Register of the National Estate. Other historic sites in the former shire include the hotel at Clarkefield, ‘Mintaro’ homestead at Monegeeta and a railway bridge over the Bolinda Creek. 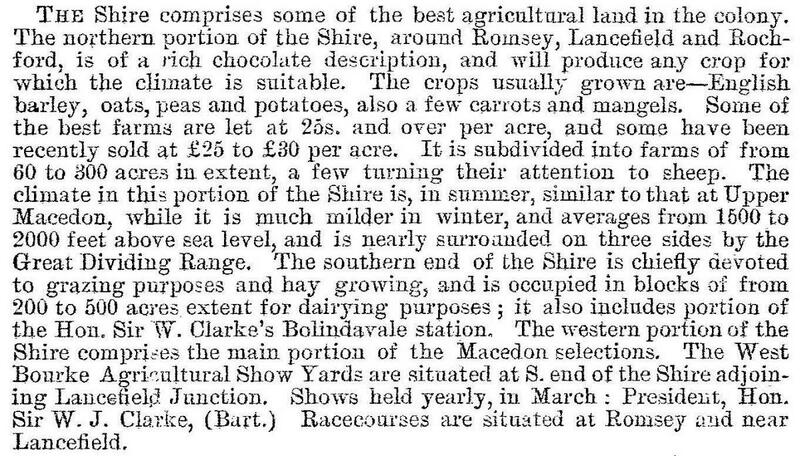 In 1994 59% of the shire was farmland, carrying 13,300 meat cattle and 108,000 sheep and lambs. Small amounts of barley, wheat and wine grapes were grown. On 19 January 1995, Romsey shire was united with Gisborne, Newham and Woodend and most of Kyneton shires to form Macedon Ranges shire.